The Wizarding World of Harry Potter at Universal Orlando Resort kicked off its grand opening celebration tonight with help from Harry Potter film stars Tom Felton, Michael Gambon, Bonnie Wright, Oliver Phelps, Daniel Radcliffe, Matthew Lewis, Warwick Davis, Rupert Grint and James Phelps. 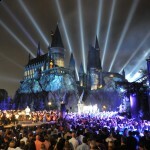 Hundreds of people gathered in front of Hogwarts castle for a spectacular display of fireworks choreographed to a special performance of music from the Harry Potter films conducted live by renowned composer John Williams. The Wizarding World of Harry Potter will officially grand open to the public this Friday, June 18. Wizarding World!!! Thats wondefull! and I saw the ther pictures in there and its really really really awesome things for all fans of harry Potter :) I hope to go there…!